This is the 20th Premier League season to be played with 20 teams and 38 games per team. For the first three years there were 22 teams. 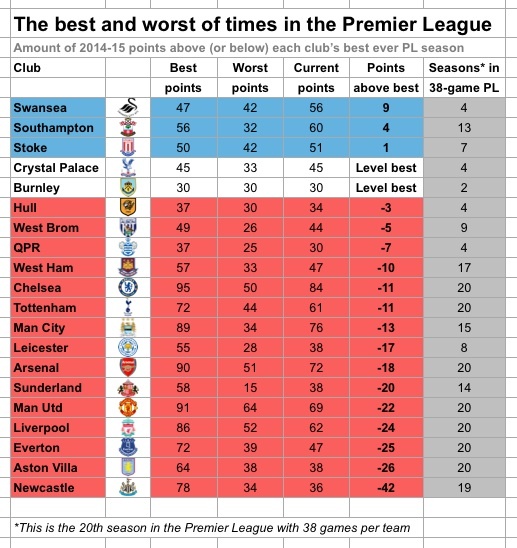 Today’s first graphic shows how many points each club has won in their best PL season so far, and in their worst, and how many points they are away from their best season. Swansea, Southampton and Stoke are already having their best Premier League seasons in terms of points. A draw or win for either Crystal Palace (at home to Swansea) or Burnley (at Aston Villa) will also make this their most productive PL season. None of the 20 clubs are in danger of having their worst Premier League season although defeat for Villa would mean they’ve had the joint-worst season in points terms. But the large majority of teams will be some way away from their best PL seasons, and Newcastle are furthest off that mark, 42 points away at this from their best tally to date, achieved 19 years ago. Has there ever been such a turnaround in a Premier League season, such a great escape as that achieved by Leicester City? Not in points terms. After 29 games they were bottom with 19 points, won at an average 0.66 points per game. In the next eight games they won 19 points at a rate of 2.38 per game, a better rate than title winners Chelsea have over the season as a whole. Newcastle, meanwhile, have gone into reverse gear, picking up a mediocre 1.21 points per game for the first 29 games and then an absolutely atrocious single point from their last eight games at a rate of 0.13 per game. It is for that reason they are in peril on the final day of the season. To get some idea of how the financial situations of these clubs have changed over time – and finance is a big influence in success in football – further reading and related articles spring from Sportingintelligence’s annual global sports salaries reports, are linked here. The 2015 edition of the report was published last Wednesday.